I heard an eye-opening statistic Sunday. A poll taken in a city with a 13+ million populace revealed Christians never explained how to follow Jesus to 80% of the people polled. I've been instructed my entire life to 'live good"; be an example. I've wrestled with that ideology all my life too. I fail to see how I can live "good enough" to bring anyone to Christ. Who does it help to attend church? The sinners on the outside of the church or the sinners on the inside? I love church but to say I attend church to help others seems like a selfish endeavor. I attend church to worship God and make myself feel good. Most of us are results-driven people. Washing a car is instant gratification. Seeing our reflection in the hood of a shiny waxed car makes us feel good and driving around in a clean car makes us feel better. Losing weight is another story. Too much time invested for slow results. Exercising to accelerate results is strenuous to say the least. Those are things we do for ourselves. What do we do for others? Washing their car is a nice gesture but it will soon get dirty again. Telling them about Jesus and how to follow him are results that will last for an eternity. 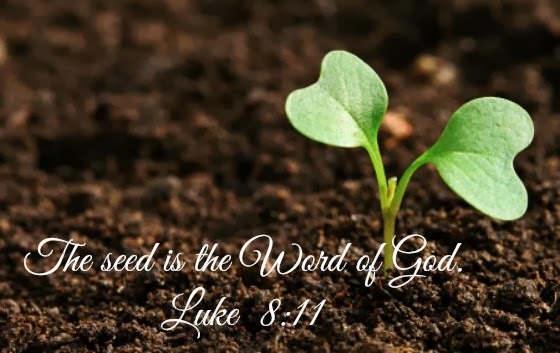 God's Word is like seeds that must be planted. Planting is not a one step process. Any gardeners out there? Grounds have to be prepared, seeds have to be planted, then comes water, sunshine and air. If the seeds come up, weeds have to be tended, fertilizer added and much patience is required to wait for the harvest. The same process happens when planting seeds for Jesus. People need to be befriended, words have to be spoken, then the Holy Spirit waters, shines on and breathes life into your efforts. Patience is required because not all seeds come up. The seeds that take roots need tended and fertilized until they are harvested. Matthew 9:37 paraphrased "The harvest truly is plenteous, but the labourers are few." This is not an easy job but the reward is excellent. We must tell people how to follow Jesus; admit your sins, ask forgiveness from Jesus and believe with your whole heart unto salvation. I wish the Holy Spirit were like E.F. Hutton, "When he speaks, people listen", but they don't. I'm guilty of brushing off the Holy Spirit. Are you? Do you ever get to June or July when people are gathering fresh vegetables from their gardens and wish you'd planted one? You had the seeds but they're still in the cabinet. It's a bummer of a feeling but there's hope for a chance to do better next year. The most awful feeling I know is to hear people are dying without Jesus because we don't have another chance to tell them about him. Don't wait for spring. The time is now. Break open the seed packets of your hearts and start sowing!